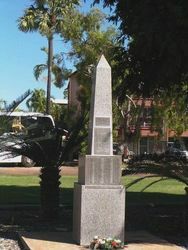 The monument commemorates the Western Australian members of Z Special Unit which served in World War Two..
Z Special Unit (also known as Special Operations Executive (SOE), Special Operations Australia (SOA) or the Services Reconnaissance Department (SRD)) was a joint Allied special forces unit formed during the Second World War to operate behind Japanese lines in South East Asia. Predominantly Australian, Z Special Unit was a specialist reconnaissance and sabotage unit that included British, Dutch, New Zealand, Timorese and Indonesian members, predominantly operating on Borneo and the islands of the former Netherlands East Indies. The unit carried out a total of 81 covert operations in the South West Pacific theatre, with parties inserted by parachute or submarine to provide intelligence and conduct guerrilla warfare. 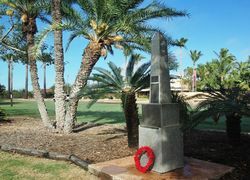 The best known of these missions were Operation Jaywick and Operation Rimau, both of which involved raids on Japanese shipping in Singapore Harbour; the latter of which resulted in the deaths of twenty-three commandos either in action or by execution after capture.